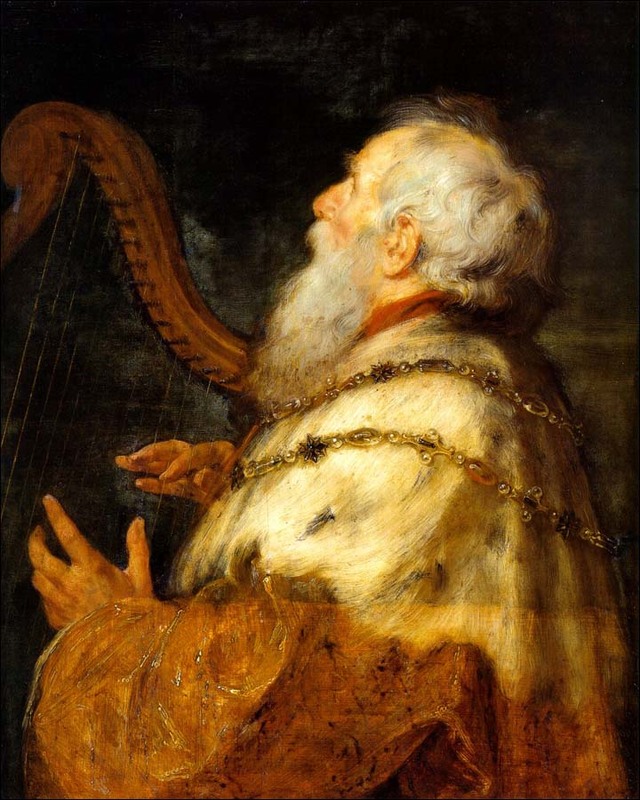 Peter Paul Rubens and Jan Boeckhorst, "King David Playing the Harp" (c. 1616, finished 1640s), oil on wood panel, St�del Museum, Frankfurt am Main, Germany. Larger image. We've looked at all kinds of psalms on our journey through the Psalter. Perhaps a fitting conclusion will be psalms of thanksgiving and praise. They bear close resemblance to other psalms we've studied. Two in particular are gems with a character all their own that has made them beloved through the centuries. They have inspired countless hymns and choruses -- Psalm 100 ("Old Hundredth") and Psalm 34. First we'll examine three psalms of thanksgiving (100, 107, and 118). Then we'll conclude with a psalm of deliverance (34). The key idea found again and again in this short psalm is giving thanks. Psalm 100 is clearly in the "hymn" genre. One of the most beloved psalms in the Bible, it has quite a history. It was closely identified with the "thank-offering" in the temple, probably sung when thank-offerings were offered on the altar. In Jewish piety Psalm 100 is a regular part of morning prayers, included among the Pesukei D'Zimrah ("verses of praise"). "Old Hundredth," based on this psalm, is one of the great hymns of the Protestant Christian churches. Psalm 100 breathes thanksgiving and praise. Let's consider it briefly. This psalm has no author, but is identified as "a psalm," probably with an instrumental accompaniment. As mentioned, the title: "A psalm of thanksgiving" identifies it with the temple thank-offering. Many of the key words in these verses we've already looked at in previous psalms. For the first three verses I've put the NIV and KJV translations side by side, since many of us are familiar with the more traditional translation. Notice the abundance of praise words in the first two verses. "Know that the LORD is God. Verse 3b can be rendered "we are his" (NIV, NRSV, NJB) or "not we ourselves" (KJV, NASB). Here's why. The Hebrew word for "not" (lō´) and "his" (lô) sound alike. Both wordings have manuscript support. Either of the words could be used appropriately here. But the sentence goes more smoothly as "and we are his." I think it also seems to fit the context better -- creation and belonging to God that is carried out in verse 3c. Notice the warm sense of belonging that verse 3 creates in us. Why should we worship? (verse 1-2). Because Yahweh is God who created us. We belong to him, like a king with his people, like a shepherd and his flock. We are not alone! We belong to the family of God and are tenderly cared for as sheep. God takes responsibility for us! And so we praise him. The psalmist calls us into the temple to present a joyful thanksgiving offering, to praise him in the courts of the temple. I'm always curious about the praise words, since they instruct us in praise. We've seen them all before. The noun "thanksgiving" (tôdâ) and related verb "give thanks" (yādā) we discussed above. The noun "praise" in verse 4b is tehillâ, "renown, praise, glory," from the verb hālal, "praise, boast."7. The verb "praise" (NIV), "bless" (KJV, NRSV) in 4c is bārak, which we discussed on Psalm 103:1. This is both an invitation to enter his presence and gentle command to praise. Why should we praise? Verse 5 gives the reasons for our jubilant praise -- God's character. These are qualities that we've seen throughout the psalms, especially in chapter 9 of our study -- his goodness and righteousness (ṭôb8), his steadfast love (ḥesed), and his faithfulness (´emûnâ9). Q1. (Psalm 100) What is the predominant emotion in Psalm 100? How does this psalm make you feel emotionally about God? What are the reasons for praise given in verses 3 and 5? What are the commands in this psalm? Another thanksgiving psalm is Psalm 107, that stands without any title or ascription in our Psalter. I wish we could give it more time, but read it on your own. It is a wonderful psalm of praise, detailing the appropriateness of our thanksgiving. It could also easily lend itself to corporate worship, with the congregation saying or singing the refrain and various readers taking the narrative portions. "The LORD is with me; I will not be afraid. It is quoted by Jesus (Matthew 21:42; Mark 12:10, 11; Luke 20:17) and the Apostle Peter (Acts 4:11; 1 Peter 2:4, 7). The imagery is from building construction, masonry. Houses of the poor were typically built from blocks of sun-dried clay, then whitewashed. Wealthier people would construct houses of stone (´eben) that was dressed to square it up using a hammer and chisel, sometimes a stone saw.10 Before placement in the building the mason would inspect each block for quality, trueness, squareness, and fit. Once he personally approved the cut stone, it would be incorporated into the building. Jesus is also referred to as the "a stone that causes men to stumble and a rock that makes them fall." (Isaiah 8:14; Romans 9:32-33; 1 Peter 2:8). Just as Jerusalem's leaders rejected him, Jesus cannot enter and reign in our hearts either until we acknowledge him for who he is: "The one who comes in the name of the Lord Yahweh." Q2. (Psalm 118) What does "the stone the builders rejected" (verses 22-23) have to do with the Messiah? What do verses 25-27 have to do with the Messiah? The psalm concludes as it began, with thanksgiving. The final verse repeats the first: "Give thanks!" This concludes our look at psalms of thanksgiving. However, there is one final psalm I'd like us to consider as we conclude our study of the psalms. It is a psalm of deliverance -- Psalm 34, one of the favorite psalms of all time. Its main structural element is an acrostic, with each verse beginning with a successive letter of the Hebrew alphabet. This structure seems to limit the psalmist's poetic themes to couplets in single verses. However, you can see a clear division between the early part of the psalm and the latter part. Rejoice with Me (verses 1-10). In a hymn of praise, the psalmist calls his hearers to rejoice along with him because of the wonderful deliverance he experienced from fear and trouble. Learn from Me (verses 11-22). Now the psalmist assumes the teacher's role, and the genre shifts to a wisdom psalm with instructions reminiscent of wisdom literature such as Proverbs. The psalmist is identified in the title as David. The occasion is also given: "When he pretended to be insane before Abimelech, who drove him away, and he left." This points to an incident described in 1 Samuel 21:10-22:1. David suddenly becomes aware that Saul is serious about killing him. So that Saul can't capture him, David flees to the Philistine city of Gath, an arch enemy of Israel. The king is named Achish. (The psalmist's designation "Abimelech" probably refers to the name of a dynasty of kings of Gath. Abimelech means "son of the king."). When Achish's servants remind him of David's military prowess exercised against the Philistines, David gets worried. After all, Goliath whom David slew as a young man was from Gath. Out of fear that he will be executed, David feigns insanity. Achish concludes he is harmless and lets him go. David doesn't stick around. But once free from danger from both enemies -- the Philistines and Saul -- he composes this psalm of praise and exhortation. The psalm begins with David's praise and then a call for others to join him. Here again we find the familiar praise words. "Extol" (NIV) or "bless" is bārak, that we found in Psalm 103:1 -- "knell, bless, praise, salute" (chapter 9). The noun "praise" is tehillâ, "renown, praise, glory," which we discussed above in Psalm 100:4b (from the verb hālal). "Boast" (verse 2) is the verb hālal, the root of "Hallelujah," which we first explored in Psalm 150:1 (chapter 4). Literally verse 2 reads, "In Yahweh shall glory my soul." Hālal means to "praise, hail, acclaim," but also to brag or boast in someone.15 "Rejoice" (NIV) or "be glad" is śāmēaḥ, " being glad or joyful with the whole disposition,"16 which we saw above in Psalm 100:2a. So often we reserve praise for Sunday morning worship. During the rest of the week we might read the Bible and pray, but is praise on our lips always? This is a matter of training, of habit. Write yourself a note where you can read it often: "Have I praised God in the last hour?" You'll fail often at first, but as you begin to remind yourself to praise, it will eventually come naturally to you. This is a part of being "transformed by the renewing of your mind" that God wants to do in your life (Romans 12:2). Can mere man make God any higher than he already is? No, but he can make God's reputation more exalted by his testimony of God's deliverance. And that is what David does in verses 4 and 6. Q3. (Psalm 34:1-3) Why should we praise God continually? What are barriers to continual praise? What does continual praise do to our spirit? How are you training yourself to praise continually? he delivered (yāsha`) me from all my fears. he saved (yāsha`) him out of all his troubles. No doubt the fears and troubles that David is recalling relate to the close call he had in the Philistine city of Gath. The term "delivered" (NIV), "saved" (KJV, NRSV) in verses 4b and 6b is yāsha`, in the Hiphil stem, "save, deliver, give victory, help. "20 A synonym is found in verse 7b translated "delivers," ḥālaṣ, in the Piel stem, "rescue, deliver, save." The root idea is "to draw off," so here David testifies that God "pulls him out" of his distress.21 Those who seek Yahweh, who look to him, are radiant22 with joy (5a) rather than "covered" with shame and sorrow (5b). David "sought the LORD" (4a) and "called" (6a); Yahweh answered. How did he answer? David suggests that his deliverance was the work of "the angel of the LORD," a phrase which suggests Yahweh himself. "Encamp," ḥānā, has the root idea, "to bend, curve," suggesting that the ancient Semitic camp was circular in layout, or perhaps that the lines of a besieging force were circular.23 If Yahweh and his host of angelic armies sets up their military encampment around believers, nothing can get through to harm them. That is the image here. Angels rescued Lot and his family from Sodom (Genesis 19:1-22). An angel shut the mouths of lions to deliver Daniel (Daniel 6:22). Twelve legions of angels could have been instantly at Jesus' disposal in the Garden of Gethsemane (Matthew 26:53). An angel woke Peter up in the middle of the night, released his shackles, and opened the doors of Herod's maximum security prison (Acts 12:6-10). Perhaps David had a similar experience of angelic intervention that allowed him to escape from the city of Gath in one piece. With the incident in Gath, God has been stretching David, teaching him to trust in, to rely on, to "take refuge" in the Lord. And God came through! Now David is excited to share this experience, to encourage others that they too can trust in God. He calls out across the centuries to you and me: "Taste and see that the LORD is good." "Taste" is ṭā`am, "taste, eat, perceive," with the primary meaning, "to try, or to evaluate with the tongue, normally with a view to consumption if the flavor is suitable. "25 Have you tasted? Have you found that you can take refuge in the Lord? If not, step out in trust at your next opportunity, your next trial. You will find the blessing of the person who "takes refuge" in the Lord. "Fear the LORD," that is, reverence him, put our confidence in him even when others around us don't take God seriously. Notice the strong ethical instruction about evil speaking, lies, unrighteous. Verse 13 spells it out in a negative format; verse 14 looks at it from a positive point of view. I am particularly interested in verse 14: "Seek peace and pursue it." What does that mean? "Peace" is shālōm. It is not merely the absence of strife, though that is part of it. Shālōm is something much broader. The general meaning behind the root is of completion and fulfillment, of entering into a state of wholeness, unity, harmony, a restored relationship. Implicit in shālōm is the idea of unimpaired relationships with others and fulfillment in one's undertakings.25 Seeking shālōm, moreover, is a state of fulfillment in God's presence, with God's help. So we are told to fear God, seek God. The same idea is found here. We are to both seek after God's wholeness and pursue it with all our strength. We are to chase peace and not quit until we have achieved it. A zeal for peace, a zeal for God. This is what Jesus was talking about when he said, "Seek first the kingdom of God and his righteousness..." (Matthew 6:33). Lord, give me a passion for You that doesn't quit! God has his channel always open to hear you when you pray to him and he listens attentively. he delivers (nāṣal) them from all their troubles. and saves (yāsha`) those who are crushed in spirit. I've been there. My heart has been broken. My spirit has been crushed. Yet I've experienced God there with me. He's there with you, too. When your troubles seem to crash down upon you and you nearly lose hope, he is with you. Call out, seek him in your lowest time. You'll find him close, nearby. Reach out. We are not immune to the troubles common to this life. We even face death, sooner often than we would like. The psalmist who lived on the far side of the cross, believed in the Lord's ultimate deliverance from trouble. On this side of the cross we see that the Lord ultimately delivers from death itself. Resurrection is our promise. The message here is: Don't give up hope. Don't quit. The Lord is with you and he will bring you through even this! We've come to the concept of "redeem" several times. We've seen the "Kinsman-Redeemer" (gā´al) who does not desert his own kin, but does what it takes to pay their debts, buy back their land, pay whatever ransom is necessary to secure their freedom. This word "redeem" here is similar, pādā, but focuses on the financial part of redemption, "to transfer ownership from one to another through payment of a price." In verse 22a, Yahweh values his servants so much that he will pay whatever is necessary to secure their freedom. This is fulfilled on the cross, where the Father gave his best, his only Son. And the Son's love and obedience met the piercing of the nails through his hands and our sins through his soul. He redeemed us at highest cost. We are worth an infinite amount to God. If you are wounded, God is close. If you are brokenhearted, he is near. Reach out. If you feel trapped he'll redeem you -- has redeemed you through Christ. If you feel guilty, he has given you an amazing promise: take refuge in him and your condemnation goes away. There it is, Psalm 34, a wonderful acrostic psalm of deliverance. It speaks across the ages from a miraculous deliverance from a Philistine city in 1000 BC, to the needs of believers in the twenty-first century AD. Our everlasting God is present to thank, to praise, to enjoy, and to deliver! Q4. (Psalm 34:18-22) What encouragement does David give to the brokenhearted? What does it mean that God "redeems" you? How can we avoid condemnation according to Psalm 34:22? Lord, thank you for your great blessings in Christ Jesus. Teach us to always have thanksgiving on our lips. Teach us to take refuge in you when we are in trouble. Soothe our troubled souls when we are wounded and broken. And give us hope, joy, and shalom in You. In Jesus' holy name, we pray. Amen. "All People that on Earth Do Dwell" (Old Hundredth), words attributed to William Keth (1561), music attributed to Louis Bourgeois (1551). "Bless His Holy Name," words and music by Andrae Crouch (© 1973, Lexicon Music, Inc.). Psalm 34:1, 3. "For the Lord Is Good," words and music by Gary Sadler and Lynn DeShazo (© 1997, Integrity's Hosanna! Music). Psalm 100:5. "He Has Made Me Glad" ("I Will Enter His Gates with Thanksgiving in My Heart"), words and music by Leona Von Brethorst (© 1976, Maranatha Praise, Inc.). Psalm 100:4. "I Will Bless the Lord at All Times," author unknown. Psalm 34:1-4. "I Will Magnify," words and music by Scott Palazzo (© 1985, Mercy Publishing). Psalm 34:3. "Lovely Noise," words and music by Greg Sparks and Rebecca Ed Sparks (© 1997, worshiptogether.com songs). Psalm 107:8-9. "Redeemed, How I Love to Proclaim It," words by Fanny Crosby (1882), music by William J. Kirkpatrick. Psalm 107:2. "Shout to the Lord," words and music by Darlene Zschench (© 1993, Hillsong Publishing). Psalm 100:1. "Sing to the Lord," words and music by Bill Bastone and Tom Howard (© 1984, Maranatha Music). Psalm 100. "The Lord Is Good," words and music by Dan Marks (© 1982, Maranatha! Music). Psalm 34:8. "The Haven of Rest," words: Henry L. Gilmour (1890), music: George D. Moore. Psalm 107:29-30. "This Is the Day the Lord Hath Made," words: Isaac Watts (1719), music, "Arlington" by Thomas A. Arne (1762). Psalm 118:24. "This Is the Day," words and music by Les Garrett (© 1967, 1980, Scripture in Song / Maranatha! Music). Psalm 118:24. "Through All the Changing Scenes of Life," words by Nahum Tate and Nicholas Brady (1698), music: "Irish" melody from A Collection of Hymns and Sacred Poems (1749). Psalm 34.3. "Thou Art My God," words and music by Tony Hopkins (© 1972, Scripture in Song / Maranatha! Music), Psalm 118:28-28. Ralph H. Alexander, yādā, TWOT #847. William White, rûa`, TWOT #2135. Walter C. Kaiser, `ābad, TWOT #1553. Bruce K. Waltke, śāmaḥ, TWOT #2268b. William White, rānan, TWOT #2179b. Tehillâ, Holladay, 387. The word is used as a technical term for "song of praise" in Psalm 145:1, Isaiah 63:7. "Good" is ṭôb, "good" or "goodness," here "moral goodness" (Andrew Bowling, ṭôb, TWOT #793a). ´Emûnâ means "firmness, faithfulness, fidelity" (Jack B. Scott, ´āman, TWOT #116e). Adrianus van Selms, "Build," ISBE 1:553-555. Jack P. Lewis, gîl, TWOT 346. Eduard Lohse, hōsanna, TDNT 9:682-684. John N. Oswalt, bārak, TWOT #285. Leonard J. Coppes, hālal, TWOT #50. Bruce K. Waltke, śāmēah, TWOT #2268. Elmer B. Smick, gādal, TWOT #315. Andrew Bowling, rûm, TWOT #213. John E. Hartley, yāsha`, TWOT #929. Elmer B. Smick, ḥālaṣ, TWOT #667; Holladay 106b, piel 3. Nāhar, metaphorical, "shine, be radiant (with joy)" Holladay 230b, II. Victor P. Hamilton, ḥānā, TWOT #690. Ralph H. Alexander, ṭā`am, TWOT #815. G. Lloyd Carr, shālōm, TWOT #2401a.